Brujita is beautiful with her big brown eyes and thick glossy multi-amazing coloured hair with a centre parting. She has long eyelashes on her upper eyelids which enhance her eyes and make her look lively! Brujita is beautiful with her big brown eyes and thick glossy multi-amazing coloured hair with a centre parting. She has long eyelashes on her upper eyelids which enhance her eyes and make her look lively! Her facepaint is beautiful and compliments her clothes and the colours in her hair, and she has a subtle scent of vanilla which is very appealing. Brujita is dressed for a Halloween party! Her outfit is very special. Brujita's arms and legs are articulated and her head turns from side to side and she can easily be put into a standing or sitting position. She has additional joints at the elbow, wrist, knee and ankle which make for very engaging play. She has a full vinyl body and can stand unassisted. Her height is 60cm or 24" and she has her own section of clothing in the My Doll Best Friend shop. The vinyl used in making the Paola Reina dolls complies with all the European regulations for quality and safety and does not include phthalates. The Las Reinas dolls are truly beautiful play dolls for children and collectors alike. 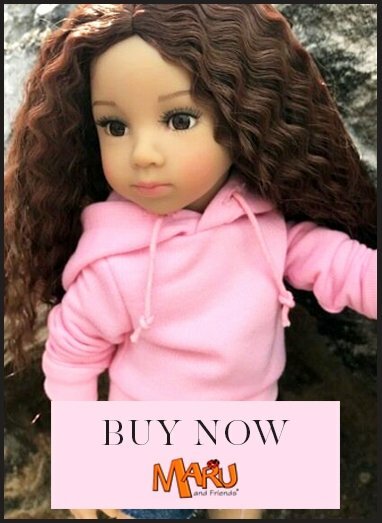 Brujita would make a wonderful gift or a beautiful doll for yourself to enjoy. Paola Reina was established in Spain in 1994 and has achieved worldwide success with its beautiful dolls.Paola Reina Las Reinas dolls are thoroughly European as not only are they made in Alicante in coastal eastern Spain, all their component parts are sourced from Europe.